Television viewers in New Zealand were unable to see the Apollo 11 Moonwalk live. In 1969, there were no satellite earth stations in New Zealand, so live TV coverage of the Moonwalk was out of the question. However, live TV would be provided to the rest of the world via Sydney, just 2½ hours across the Tasman Sea by air. Thanks go to Doug Bennett in New Zealand who sent the news clippings via Dwight Steven-Boniecki. Jet speed from the moon... that’s how New Zealand television viewers will get their film of the Apollo moon landing next Monday night. As soon as the transmission is picked up at tracking stations in Australia film will be taken and sped to the Richmond Air Force base in New South Wales. There, a RNZAF Canberra will be waiting to fly it across the Tasman to the Whenuapai Air Force base in Auckland. Automatic Customs clearance has been arranged at Auckland, said the NZBC’s public relations officer, Mr L. Boyes, in a telephone interview from Wellington today. If Whenuapai is to be closed, the Canberra will land at Auckland International Airport. Touch down in Auckland is expected to be 10 pm. Half an hour later the film should be ready for nationwide screening. Scheduled programmes would be interrupted, said Mr Boyes. “We have chosen programmes that aren’t too bad for interruption,” he said. The film will be shown on a national television linkage originating from Auckland. “If the film arrives earlier, then we’ll put it on as soon as we get hold of it,” said Mr Boyes. Auckland astronomers will try to photograph the Apollo-XI capsule while it is on its trans-lunar trajectory this week. The attempt will be made in the course of observations to be made by the Auckland Observatory at One Tree Hill as part of a world-wide astronomical programme. The world-wide programme is planned to observe what are known as transient lunar phenomena and has been organised by the Smithsonian Institute under the guidance of Dr Barbara Middleton, a world authority on the solar system. The Auckland Observatory is to attempt to obtain photo-electric observations of the crater Aristarchus, which have probably not been carried out successfully anywhere in the world. It could provide valuable evidence about the events. During this time the attempt to photograph the capsule will be made. Some 4½ hours after astronauts Neil Armstrong and Edwin Aldrin set foot on the moon today, New Zealanders saw a film of the historic event in a nation-wide television hook-up. The 40-minute videotape was rushed to Wellington aboard an RNZAF Canberra bomber. The videotape was recorded this afternoon at the Australian Broadcasting Commission’s Gore Hill studios north of Sydney. The Canberra carrying the tape left Kingsford Smith Airport, Sydney, at 4:15 p.m., and after a 2½-hour flight, touched down at Wellington just before 7 p.m., an NZBC spokesman said tonight. It was taken to Channel 1 in a car accompanied by a Ministry of Transport officer, in time to be shown in the NZBC’s 7:30 p.m. news. The spokesman said Customs and air traffic officials in both Sydney and Wellington gave the Canberra priority status, allowing it to clear formalities in the minimum time. He said the corporation had not known until late this afternoon what time the tape would be available. The historic screening was rescheduled three times. 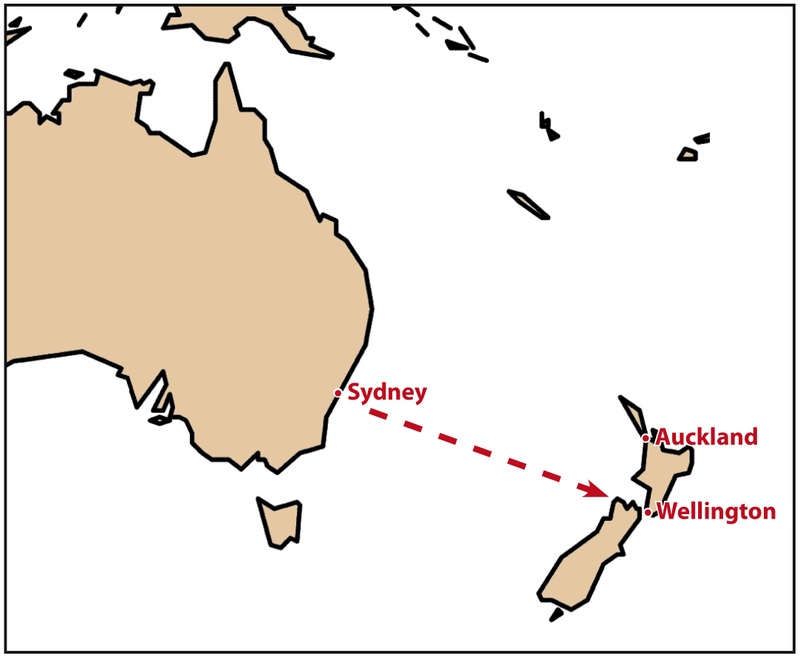 If the Canberra had been unable to land at Wellington it would have gone to Auckland, and the national network hook-up made from there. Back to the Honeysuckle Creek home page.